NORTH HAMPTON, N.H. — Anyone under the impression that Jeb Bush has the Republican nomination all locked up already might want to spend a day on the campaign trail with Scott Walker. Mr. Bush and Mr. Walker appear similar. Both are Republicans who were twice elected governors of states where Democrats often win statewide elections. Both are tax cutters — Mr. Walker speaks of cutting $2 billion in taxes in Wisconsin, while Mr. Bush speaks of cutting $19 billion in taxes in Florida. Both are education reformers who clashed with teachers unions. Both are national security hawks that oppose President Obama's deal with Iran. Both speak of "peace through strength" and say they want to reverse Mr. Obama's cuts in defense spending. Both say they want to restore warm relations with Israel. Both aim to increase economic growth by paring back federal regulations and by encouraging more domestic energy production. And now both are running for president of the United States. At the moment Mr. Bush has an edge in fundraising and in nationwide polls, which imposes on Mr. Walker the delicate burden of explaining to voters in early primary states such as New Hampshire why they should vote for him rather than Mr. Bush. It's delicate because if Mr. Walker criticizes Mr. Bush too hard, he risks violating Ronald Reagan's 11th commandment of not personally attacking another Republican. Such attacks could also backfire by making Mr. Walker look like an ankle-biter, by providing fodder for future Democratic campaign commercials, or by ruining any chance Mr. Walker may have of being vice president on a Bush-led ticket. They could also undercut Mr. Walker's great strength, his ability to project a kind of Wisconsin "nice" calm optimism while carrying out seriously transformative conservative policies. So Mr. Walker draws the contrast with Mr. Bush as sharp as he can while still being subtle. He does not mention Jeb Bush by name. But the message is clear enough to be unmistakable to anyone paying attention. The morning crowd at Joey's Diner in Amherst is so large than not everyone can fit inside the restaurant. Mr. Walker hops on the back of a red Chevy pickup in the parking lot (with both a National Rifle Association sticker and a "Don't tread on me" Tea Party flag decal in the rearview mirror) to address the overflow crowd. He speaks of the need for "new, fresh leadership," a line that could have been aimed at either Mr. Bush or Hillary Clinton. Inside, his remarks stress his humble background. "My first job as a kid was washing dishes at the Countryside Restaurant," Mr. Walker says. Then he moved up to flipping burgers at McDonald's. His mom was a "part-time secretary." His dad's dad was a machinist. "We didn't inherit fame or fortune from our family," Mr. Walker says. He doesn't say, "unlike Jeb Bush," but he may as well have. "No common core," Mr. Walker says, shorthand for a set of national education standards that Mr. Bush backed. The Wisconsin governor gives a version of the same speech later in the day at a second campaign stop, at a Harley-Davidson motorcycle dealership in North Hampton. There, he is accompanied and introduced by Scott Brown, the former U.S. Senator from Massachusetts, who has relocated to the Granite State. "We need new, fresh leadership," Mr. Walker says. "My first job was washing dishes...We didn't inherit fame or fortune from our family." He retells a story about shopping at Kohl's — he starts at the rack of items reduced to $19.99 from $29.99, then uses a coupon for another 15% to 30% off, then his wife Tonette reaches into he pocketbook for some "Kohl's cash," and by the time the transaction is over the store is basically paying Mr. Walker to take the shirt off their hands. Mr. Walker says he is telling it to illustrate something about supply-side economics — the "Kohl curve" instead of the Laffer curve, lower the tax rate and broaden the tax base. But the effect is also to convey to people that his household finances operate on a different order of magnitude than those of Jeb Bush, who has earned nearly $29 million since 2007. Another line of Mr. Walker's speech draws a subtle contrast with Mr. Bush on immigration policy. "Our priority should be on American working families, their wages," he says. It's a line he speeds through soft-spoken, but nonetheless it's in there, implying somehow that immigrants undercut the wages of American workers, rather than, as Mr. Bush might suggest, contributing to economic growth. Toward the end of the speech, Mr. Walker divides up the rest of the Republican field, without naming names, into two categories: fighters and winners. "There's only one in this election who has done both," he says. He's talking about himself. The candidate is pressed on the way out of the event by an Associated Press reporter, Kathleen Ronayne, about what that "only one" formulation means about Chris Christie or Jeb Bush. Are they not fighters? Not winners? Mr. Walker clarifies that he is talking about "the recent fights the last few years that matter" — tax reform, right to work, "concealed carry," Planned Parenthood, tenure, seniority. The "recent" and "last few years" formulation is a way of reminding people that Jeb Bush's last year as governor of Florida was 2007. Mr. Walker entered office in 2011. The thinly veiled Bush-bashing meets a receptive audience among New Hampshire activists I talk to at the events. "We had too many Bushes," says Phyllis Moskowitz, a retired real estate investor who lives in Nashua and who is in a booth at the diner in Amherst for the Walker event. Ken Dufour, 65, a real estate appraiser from Nashua who is at the Walker event in Amherst, describes Jeb Bush as "too moderate," mentioning his views on immigration and on a common core education. Eli Boumitri, 46, a Coca-Cola merchandising salesman who lives in Derry and who is at both the morning and afternoon Walker events, calls Mr. Bush "boring." "There's no excitement in his voice," Mr. Boumitri laments. These three aren't necessarily representative New Hampshire voters. They are people who are motivated enough to show up during a weekday at a Walker event. 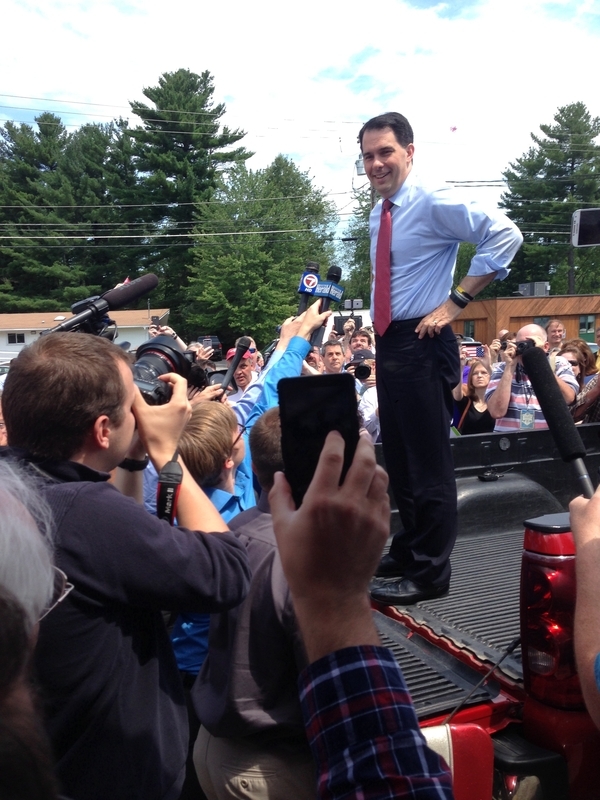 Mr. Walker is betting there are enough voters like them to give him a path to victory in the Granite State. He announces he'll be back on a weekend in a few days to begin making good on his commitment to ride through every county in the state of New Hampshire on a Harley-Davidson motorcycle. The Wisconsin governor says he owns a 2003 Road King with 21,000 miles on it, along with a Harley wallet and a Harley credit card. "People who like this hobby talk about the sense of freedom they get from it," another Harley-riding Midwestern Republican governor, Mitch Daniels, once wrote. It's hard for me to imagine Jeb Bush on a motorcycle, though he reportedly has an invitation for a ride with Joni Ernst, a Republican senator from Iowa. A worst-case scenario for the Bush campaign would be that such a ride would result in an image something like the infamously incongruous one of Michael Dukakis in a tank. Mr. Bush is more of an Uber guy. If you do see the front-runner from Florida straddling a Harley, it will be a sign that Mr. Walker is getting traction. When Jeb Bush starts paying as much attention to Scott Walker as Scott Walker is now paying to Jeb Bush — well, then we'll have a real race on our hands. I'd rather see them engaging in a high-toned substantive debate over tax, immigration, or trade policy than getting in an ad hominem (and unwinnable by Mr. Bush) contest over who had the most hardscrabble upbringing or pays less for shirts. But the campaign is just getting started.